For as long as I can remember, I’ve enjoyed being a creative person. I’ve occasionally been labeled “artsy-fartsy” or some similarly dismissive phrase. And I’ve struck back and used my own pejorative, the phrase “corporate drone,” to describe somebody I perceive as having little imagination, but in spite of my personal attachment to the creative process, I can also empathize with people that are thwarted or daunted by it. A lack of rules, a lack of structure, and maybe even an indeterminate goal: that’s pretty scary to some people. For others, though, it can lead to adventure. I find that creation arouses multiple pleasures in my brain. First, the process of creation demands my problem solving skills since I am constrained by the limits of a particular medium (I love low-stakes challenge). Second, I feel a swell of pride when I create something unique to me — oh yes, somebody else has likely made it before, but that won’t diminish my sense of accomplishment. Does it ever bother me to climb a mountain and learn somebody else has climbed it before? No. And last, creation yields surprise; the less attachment I have to a goal, the greater my surprise will be. As a child, I enjoyed folding paper squares to craft origami animals. I found my first origami book at a public library and started with the simple designs I could comprehend. Often, I was baffled by the instructions in the books. 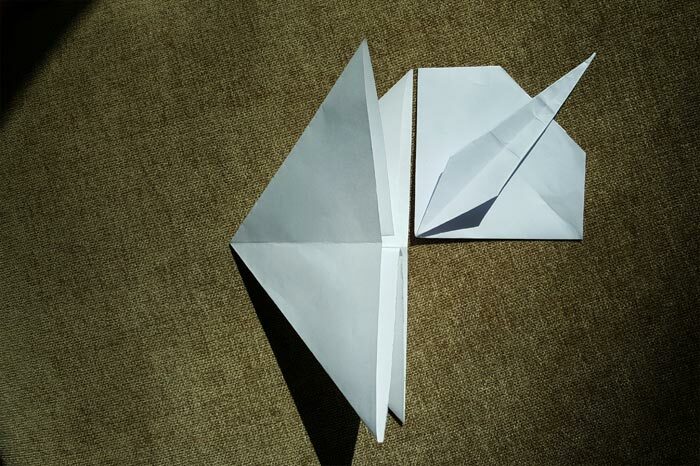 I would see side-by-side illustrations of origami-in-process (a “before and after” for a particular step) and wonder how the hell I was supposed to get from diagram A to B. In every book, I would find several designs that became my favorites, but there were many I disliked; in the 80’s, there was a dearth of dinosaur designs in origami books as I recall. Sure dinosaur origami is popular now, but not when I was a kid. The lack of appealing designs became the impetus for a journey to create designs of my own. Over time, I designed a triceratops, a pterodactyl, and a t-rex. I can’t recall my age at the time, but the dinosaur theme suggests I was still fairly young. The triceratops I made required the use of scissors (verboten among origami enthusiasts!) but it enabled me to achieve the look I wanted. I saved all of my personal creations, and I even used pencil and paper to jot down rudimentary instructions for them. For a while, I fantasized about making a book of my own origami designs but eventually abandoned the idea. Since then, however, my connection with origami has withered. 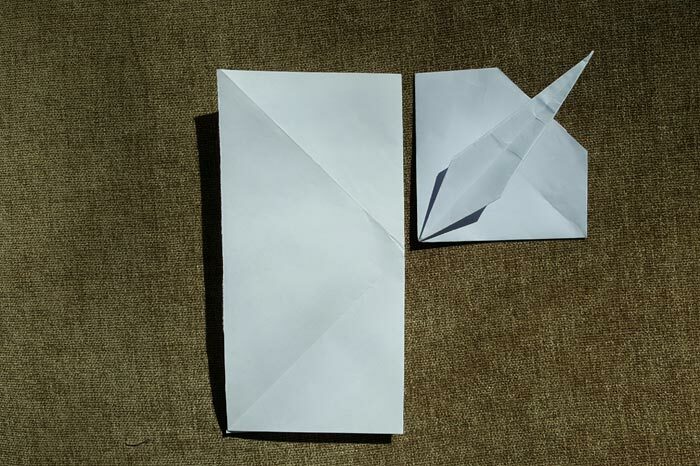 For most of my adult life, I’ve practiced origami to repeat old, familiar forms that I know by heart: the flapping crane, the waterbomb (box), and four-petal flower. I haven’t attempted any new creations in quite a while. Recently, though, I took a dare from a friend and agreed to make something new, and the experience reconnected me with the creative process. On a roadtrip, I sat in the backseat of a truck and started folding a square of paper. I had no goal or desired outcome in mind, so I just had a long conversation with the paper and the shapes I saw. Along the way I asked, “What happens if I open and squash this part here?” and “Does this remind me of anything?” Eventually, I ended up with a skate–or maybe it’s a stingray. I was very pleased with my creation. I’ve seen stingray designs in origami books before, but this was the one I had made all on my own. Learn skills from a master and develop an understanding of the medium. Experiment in small ways such as through altering a familiar form. Explore making original creations. Make mistakes. 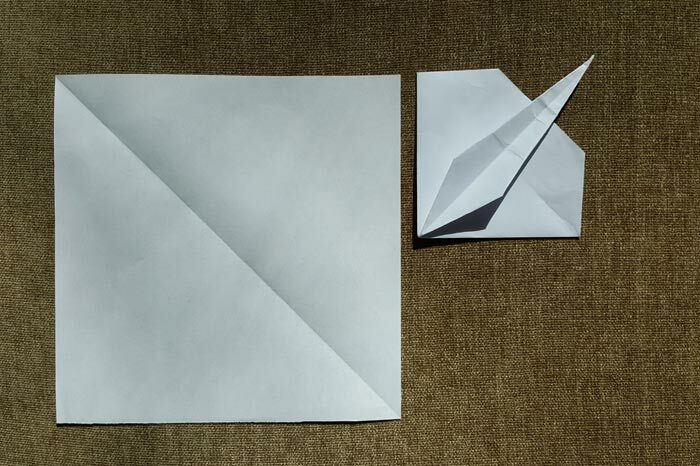 The form (left) is a common starting point in origami. My next-door-neighbor’s son, Anton, was eleven years old and loved to come over to my apartment to assemble my Lego® kits. Legos were my favorite building toy as a child, and I own a sprawling collection that occupies multiple storage tubs. Anton thought it was Smaug’s treasure horde and I the parsimonious guardian. I enjoyed watching Anton build the kits at my kitchen table. I would cook or wash dishes while he read the building instructions from my laptop. Occasionally, he made mistakes. Sometimes he undertook a building project that outlasted his endurance, so I would help him by sorting colored pieces for him. I thought for sure that he had seen alternate building suggestions on his own Lego boxes. For years, that was a hallmark of the Lego brand: the front of the box showed the toy fully constructed, and the back of the box showed alternate builds made from the same pieces. There were never instructions for those, and kids just had to figure them out on their own. But Anton collected Legos from the franchise lines like Star Wars™ and Hero Factory™, and he seemed content with the final product promised on the box front. I knew his sister built her own creations. Ana was two years younger, and she built a variety of wonky contraptions–all with amusing functions. Is a marshmallow gun a food source or mob deterrent? Probably both. They were the typical creations I expect of younger kids: constructed with poor symmetry, lacking structural integrity, and utilizing too many primary colors–the kid aesthetic. I was concerned that Anton was a by-the-book builder. Maybe he was afraid to make something flawed or imperfect. Maybe I just had to nudge him. A week later, I went next door to visit his mom, Ali, and as I entered the apartment, Anton left the living room to race upstairs. A moment later, his feet thumped down the stairs again, and he presented me with his latest creation. It was a Lego spaceship: the USS Enterprise. He’d been watching the original Star Trek series with his mom and dad, and he’d built his own Lego design. His model was a garish pastiche of Frankenstein parts and colors. It was a flimsy construction with poor symmetry, and the starboard nacelle wobbled precariously. I was fearful he expected me to take it from his hands, so I remained seated and critiqued his work from a chair. Anton cradled the delicate craft in his hands and stood beaming in front of me. I could tell he was proud of what he’d made. So was I. All photos by Spriggan Radfae. Streetlight Magazine is the non-profit home for unpublished fiction, poetry, essays, and art that inspires. Submit your work today!